Disclaimer: game includes some adult themes (and by some I mean many). So you may remember that I reviewed a game awhile back called Equestrians Against Normalcy. 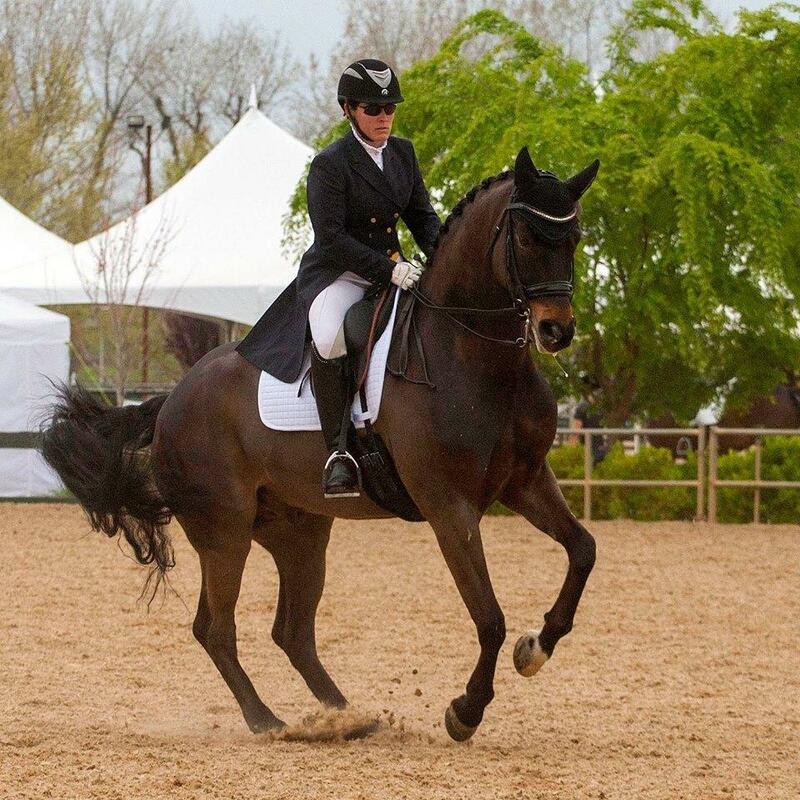 It was epic, in that warped sort of way that only an equestrian could appreciate. Now, the same brilliant minds behind Equestrians Against Normalcy have created Stable Showdown, described as “all the fun and excitement of running your own boarding facility but without the resulting bankruptcy and alcoholism.” Having run a few facilities I can confirm this to be true (the being broke and the alcoholism that is). Although I have recently been dealing with multiple broken water lines under my BRAND NEW BARN (see above about being drunk and broke) and a builder refusing to take responsibility, I did manage to once again round up a couple of my horse crazy brethren, snacks, and adult beverages so we could give this game a proper go. We were not disappointed. To start, depending on the number of players, 10 to 16 stall cards are dealt for each player. These stalls are set up in a rectangle so that each stall has a neighbor and there’s a large opening in the center. Here are my 10 stalls. In the center is the reminder card so you don’t forget silly things. This is also where you’d place any perk cards. 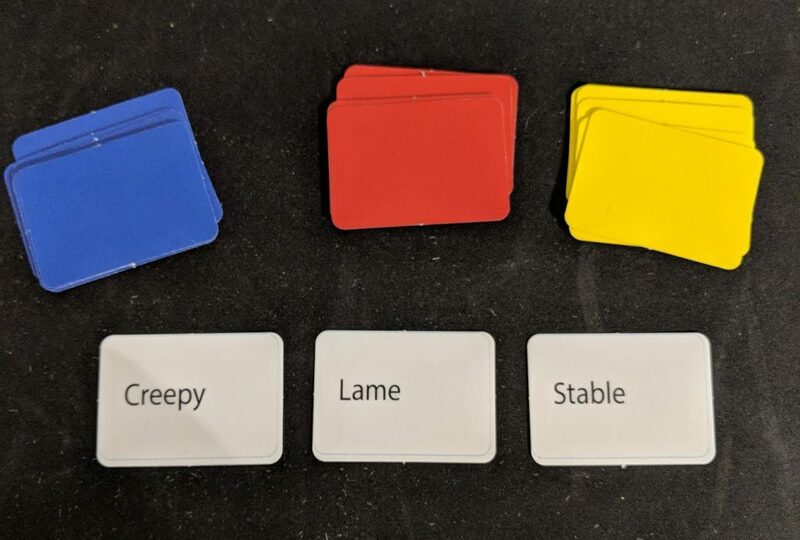 Then each player draws a micro card from the blue, red, and yellow decks. These determine your stable name, ordered as seen below with blue being first, then red, then yellow (just like placing at a show). My barn name seemed a little too close to home. Why do I feel like I have boarded at this place before…. Once every has their sketchy stable name they’re given seven cards from the deck. These cards will either be horses (both positive and negative ones), perks, or negative cards. During each round, a player may play as many of their cards as they would like on their turn. 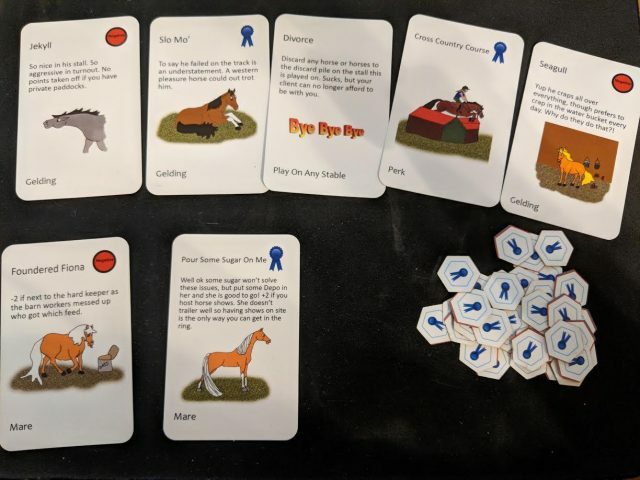 Players can keep the good horses, put the bad ones in opponents’ stalls, dole out negative cards to their “friends,” and claim their perks and blue ribbons (be sure to ASK FOR your blue ribbons when you play the card, otherwise you won’t get them and you’ll be sad). After players have played their cards they then replenish their hand to seven cards and the backstabbing — err, fun — starts all over again. This continues until you’re all no longer friends or you’re too drunk to continue. Kidding. Sort of. Once you all decide to wrap it up, everyone counts their blue ribbon cards, deducts the points from any negative cards they have collected, and the player with the most blue ribbons after those shenanigans wins. 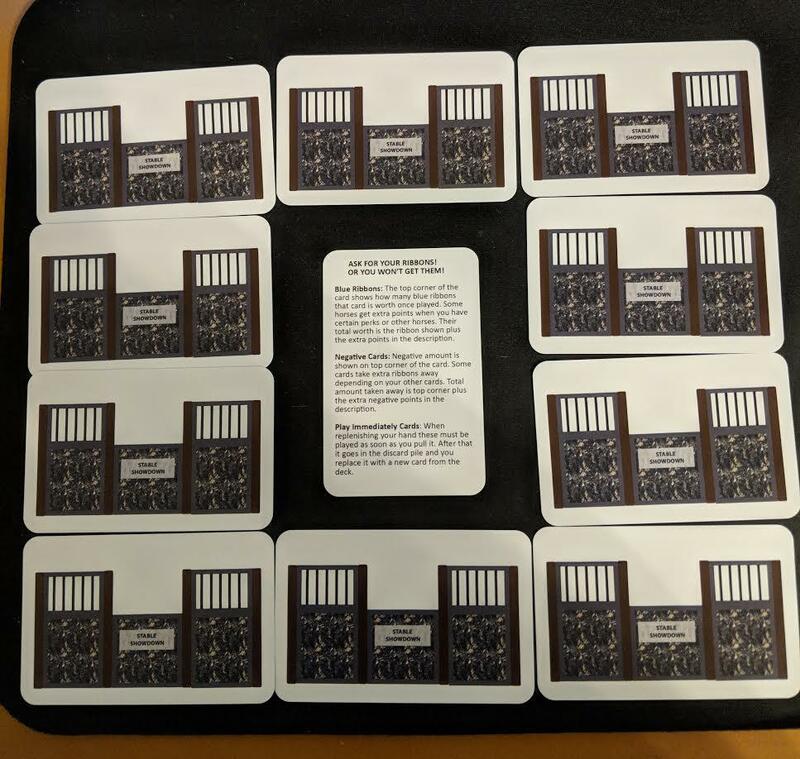 Some of the fabulous cards I drew for our first go. Clearly Foundered Fiona and Seagull got to go live at my dear friend’s barn. I happened to be playing with some fellow trainer friends and I must say that the conniving was exemplary. After a few rounds of snickering and sticking each other with cribbers and negative cards like the “Drama Llama,” it was pretty clear we were all pretty adept at being awful human-beings. Doh. We did have an absolute blast doing it though (perhaps that’s a larger problem we should look into)! And one nice feature of this particular game is that you can keep the snark at whatever level seems appropriate to the specific players; i.e. if you’re playing with younger, kinder kids you can still do so without entirely crushing them with your cynical ways. 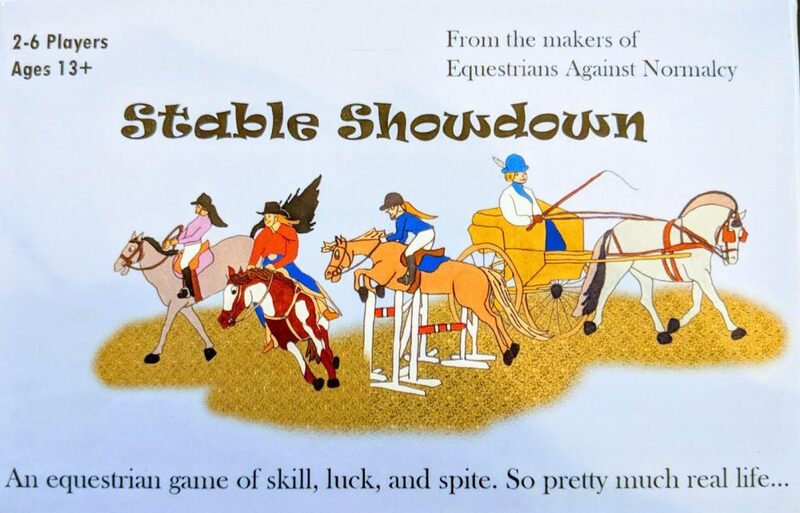 Ultimately, Stable Showdown was so amusing we decided it will be making the trek to our show next weekend so we can break it out again to distract ourselves from the horse show mayhem. If you’re amused by snark, understand the seedy underside of the equestrian world, or are just immersed in all things equestrian, then this game is for you! You still have time to snag this gem of a game up for the crazy horse people in your life for the holidays! Check out the official Equestrian Showdown for more information and ordering. You can also visit their Facebook page, where they’re doing some giveaways! Go Riding! Then play adult themed card games!